280- .500 offset, pre-belt drive models, 5-speed. 530 chain, spline width of .500. Available in 22-24 teeth. 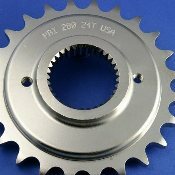 By changing sprocket spacers on mainshaft, will fit all 5-speed models. OEM part numbers for spacers from you local dealer, (33334-79 =.6870 spacer), (33344-94 =.600 spacer) and (33334-85 =.8490 spacer). View PDF Drawing of all H/D offsets at the bottom of this page. See Offset drawings, pdf file.